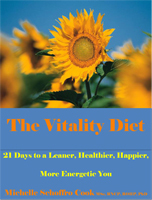 In the cutting-edge e-book, The Vitality Diet, Dr. Cook guides you step-by-step to make dietary changes that support energy, vitality and balanced weight. Dr. Cook shares valuable information you won't find anywhere else, like her proprietary chart of 11 potent phytonutrients that burn fat and where to find them. You can benefit from this fantastic resource no matter whether you already eat well or if you are on the high-sugar, high-fat standard American diet. And don't worry about deprivation or radical changes, Dr. Cook coaches you to transform even the poorest of diets. Dr. Michelle Schoffro Cook, MSc, PhD, is a international best-selling and 11-time book author whose works include: Allergy-Proof, The Phytozyme Cure, The Ultimate pH Solution and the 4-Week Ultimate Body Detox Plan. She is a Doctor of Traditional Natural Medicine, Clinical Nutritionist and publisher of World's Healthiest News.